grand gravey: What should the Xbox Zune be? I made this in response to a blog I read on Xbox 360 Fanboy. I would like to see the Xbox Zune add-on for your Xbox 360 controller. It would snap on where the battery is inserted and allow you to use the Xbox 360 controller as part of the Xbox portable console. There could also be a travel D-pad made for it that would be smaller and have the same functionality in case you did not want to use the Xbox 360 controller to travel. I just think with the most comfortable controller on the market, it being wireless, already utilizing a battery, and it being your normal mode of play, it seems the most logical choice as the input for a portable as well. 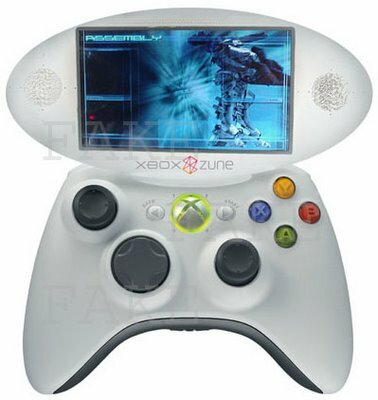 It would also be an answer to the portable used as a controller feature the other consoles are screaming right now and could do a lot to enhance the current Xbox 360 (I am not sure what though, I don't like the portables used as controllers). I am not worried about a portable game system being an everything system. I do not want to carry a box in my pocket to do everything with. I have a PSP and I only use it for the games. It is not really useful as an mp3 player (too bulky), not useful for watching movies (screen too small, UMDs are expensive), and not really useful for file storage (2 gig card right now). I have a laptop to watch movies on the go (17" widescreen format) so why would I want a 3-5 inch movie screen? I have a MP3 player to listen to music on the go, why chance breaking my $100-200 portable game system? My point is, the Xbox Zune should be a portable game system, that is all. Keep the Zune player for media a separate product. I dislike all in one products. None of them ever do all the things you want, how you want them done.